Flood Zones 101: Where are the Flood Zones in Tampa-St Pete-Clearwater? Those of you who watched my Lay of the Land video know that working with real estate investors often requires me to work with maps. 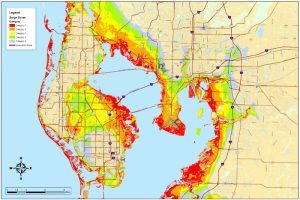 This post focuses on a topic that is crucial to Tampa Bay real estate investors: Flood Zone Maps. When working with real estate investors in the Tampa Bay area, one topic that always comes up is the issue of flood zones. My general advice is, Unless you are targeting vacation rentals on the beach, there’s really no reason to buy and hold an investment property in a flood zone. Flood insurance is an unnecessary expense, and there is a lot of long-term uncertainty association with the National Flood Insurance Program*. It’s almost always better to buy a property a few miles, or a few blocks, away that does not come with this expense, or this risk. Got it? No? Me either! Based largely on elevation, and the geological and hydrological features of an area, there are different levels, or zones, designated on the flood zone map. These are rated based on the likelihood of a flood occurring over 100-year period (referred to as base flood elevation or the “100-year flood plain”, which equates to a 1% chance of flooding each year) and a 500-year period (the “500-year flood plain”, which equates to a .2% chance of flooding each year). Zones V, A, and AE (Located within the 100-year flood plain) – This includes most of our waterfront neighborhoods and other low lying coastal areas (see map video below). These areas require flood insurance if financed. Zone X-500 or X (shaded) – This is literally an “in-between” zone. It’s above the base flood elevation/100-year flood plan, but below the 500 year flood pain. These areas may or may not require flood insurance, depending on your lender and the elevation of the structure itself. Zone X – Zone X is as good as it gets. These areas are above the 500 year flood plan and do not require flood insurance. Flood Zone X is a “non flood” zone. (That doesn’t mean it never floods. It just means statistically, it’s not very likely). What is Flood Insurance and why would I need it? Many consumers and real estate investors are surprised to hear that standard homeowner’s insurance policies do not cover flooding from rising water (for example, they would cover a plumbing leak, but not a river breaching its banks and flooding your house). Thus, properties at risk of flooding should be covered by a separate flood insurance policy. No….unless you have any kind of bank financing on your property. If you own a property free and clear, no one cares if you have flood insurance. No one will ever ask you for it or require you to purchase it. However, if you have a mortgage or home equity line on the property, or ever plan to do any type of conventional financing (such as a refi), your lender will require to keep both a homeowners insurance and flood insurance policy in effect at all times if it is located in a flood zone. Private lenders may or may not require flood insurance. Obviously, this can vary based on the location and value of the property, elevation of the property, and other factors. A very rough rule of thumb is 1% of the value of the property as an annual flood insurance premium. For example, a $200,000 home in flood zone A might require a $2000/yr flood insurance premium. (Keep in mind this is separate from, and in addition to, your homeowner’s insurance premium). Where are the flood zones in the Tampa Bay area? Are Flood Zones the Same as Evacuation Zones? No. Although the two often overlap for obvious reasons, hurricane evacuation zones are set by local emergency management and regional planning officials to facilitate an emergency evacuation for a hurricane. This is based largely on the risk of storm surge inundation, and can differ from the 100-year flood plain noted above. It is possible to be in Flood Zone X (non flood zone) an still be in a hurricane evacuation zone. Always follow the advice of your local emergency management officials. 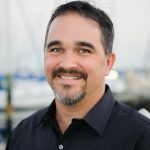 Jeff Copeland is an investor-friendly real estate broker and property manager in St Petersburg, FL (and was once a local emergency management official in a former life). Have additional questions about real estate investing in the Tampa Bay area? Drop him a line at jeff@copelandmorgan.com!